On the 6th September 2016, the Bible Lands Museum in Jerusalem opened a highly waited for exhibition entitled “In the Valley of David and Goliath” which publicly displayed, for the first time, important archaeological findings. The exhibition revealed artifacts of the mystical two-gated city from 3000 years ago, newly unearthed from a site in the Elah Valley, known by its modern name of Khirbet Qeiyafa and raising the question of whether evidence has been found of King David’s footprints in the Elah Valley. These amazing discoveries resulted in the archaeological world raising many interesting questions about who the residents were of this two-gated city and whether they were Canaanites, Philistines or maybe even the subjects of King David himself. 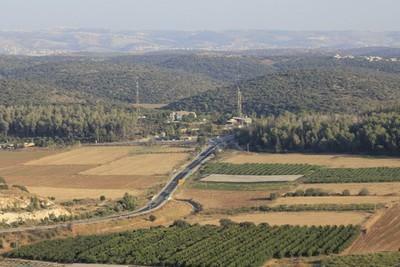 Has the biblical city of Sha’arayim that was mentioned in the battle of David and Goliath been found? Amongst the exciting artifacts found was a captivating inscription written in Hebrew which could perhaps be the oldest to be discovered to date. Other artifacts are unusual cultic shrines discovered in ritual rooms and a unique stone cultic shrine model decorated with architectural elements that appear to echo the biblical descriptions of King Solomon’s Temple and his Palace in Jerusalem. Built between Sokho and Azekah the city was situated on the Philistine and Judean border that is in the area that has been identified as the location of the battle between David and Golaith. Carbon dating from the site shows that this city existed around the 11th and 10th century BCE which was the beginning of the Kingdom of Israel. It is suspected by Historians and archaeologists that David’s Kingdom had spread south and that it is possible that the city was established in an effort to control the main road leading to the hills of Judea and as protection against the Philistines. The excavations were conducted for seven seasons from 2007-2013, led by Prof. Yosef Garfinkel, Yigal Yadin Chair of Archaeology at the Institute of Archeology at the Hebrew University of Jerusalem, together with Sa'ar Ganor from the Israel Antiquities Authority, and Prof. Michael Hazel of the Southern Adventist University of Tennessee.